These Static-Control Gloves have a Nylon/Copper glove material, which combines durable, abrasion-resistant nylon with copper fibers to reduce static buildup. They're size L and have a 1 x 10^4 ohms surface resistivity. They have a Polyurethane coating, which is a grippy material that won't limit movement when working with small or delicate parts and resists oil, gasoline, fats, greases, and solvents. They have a textured surface finish, which enhances grip in wet or slippery conditions. They are the following colors: gray and white. They have a knit cuff style, which absorbs perspiration and has a snug yet comfortable fit at the wrist to help keep out dirt and debris. Includes 1 pair. 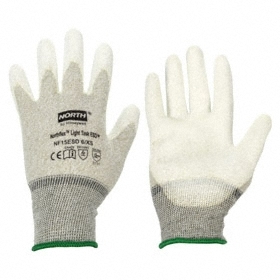 Handle electronic devices and other static-sensitive components with care using these gloves. They are made from materials that help prevent the creation of a potentially damaging static charge when handling items. Commonly used for electronic component handling and assembly in the telecommunications, aerospace, and general electronics industries. Launder these static control gloves in between tasks to ready them for the next use and avoid the cost of replacing gloves. They are well suited for tasks where you're handling items that cannot be contaminated by the exterior of the glove.